The US government has been relying on its standard narrative that the Syria crisis emerged spontaneously after an “Arab Spring” inspired protest was violently suppressed by the Syrian government. The entire US intervention was justified on these grounds. Thus the Obama Administration, as it did in Ukraine, has attempted to disavow any role in fomenting the uprising and thus any responsibility for the violence that ensued. But like much else in US foreign policy the narrative is wholly false, constructed to propagandize the American people in favor of US intervention and shield the US government from any fallout. In fact the US government had long had its sights on regime change in Syria, starting at least with the Project for a New American Century’s plan peddled to George W. Bush to overthrow five countries in five years and remake the entire Middle East. The neocons always like to think big, but like any slimy salesman they never deliver as promised. Their Iraq “cakewalk” proved a deathwalk. 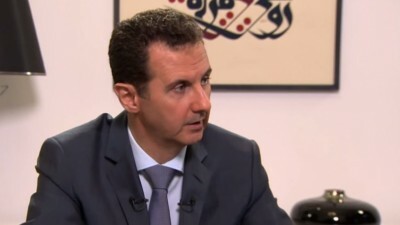 In 2006, according to a secret State Department cable made public by Wikileaks, US Embassy Damascus drafted an extensive memo outlining nine “vulnerabilities” of the Syrian government with corresponding “possible actions” on how the US can exploit these “vulnerabilities” to destabilize the government of Syria. The State Department cable was authored by William V. Roebuck, who was at the time the Political Counselor at the US Embassy in Damascus. Roebuck has since been rewarded for his “good work” on destabilizing Syria and now serves as US Ambassador to Bahrain, where one presumes his role is rather the opposite of what it was in Syria. Roebuck’s bio suggests he has been somewhat of a regime change rock star: He managed the fallout from US regime change operations in Egypt, Libya, and Iraq, with a stint at the US Embassy in Israel as well. What did Roebuck advise the US to do to Syria in 2006? Exploit the Syrian government’s fight against Islamist extremists in attempt to undermine Assad’s position in the region. That’s right: use Syria’s fight against al-Qaeda against it. Extremist elements increasingly use Syria as a base, while the SARG (ed: Syrian government) has taken some actions against groups stating links to Al-Qaeda. With the killing of the al-Qaida leader on the border with Lebanon in early December and the increasing terrorist attacks inside Syria culminating in the September 12 attack against the US embassy, the SARG,s policies in Iraq and support for terrorists elsewhere as well can be seen to be coming home to roost. Possible Actions: — Publicize presence of transiting (or externally focused) extremist groups in Syria, not limited to mention of Hamas and PIJ. Publicize Syrian efforts against extremist groups in a way that suggests weakness, signs of instability, and uncontrolled blowback. The SARG,s argument (usually used after terror attacks in Syria) that it too is a victim of terrorism should be used against it to give greater prominence to increasing signs of instability within Syria. (emphasis added). The bottom line is that Bashar is entering the new year in a stronger position than he has been in several years, but those strengths also carry with them — or sometimes mask ) vulnerabilities. If we are ready to capitalize, they will offer us opportunities to disrupt his decision-making, keep him off-balance, and make him pay a premium for his mistakes. Yes, they were ready to capitalize. And more than 200,000 people have been killed as the US “capitalized” on vulnerabilities produced by Assad’s fight against terrorists unleashed on his country by the US attack on Iraq. At this point, US foreign policy toward Syria has become too grotesque to even contemplate. In another time there would be a Nuremberg readying the dock for Roebuck and anyone else associated with this mass murder. These days the media just keeps churning out a steady diet of US regime propaganda.